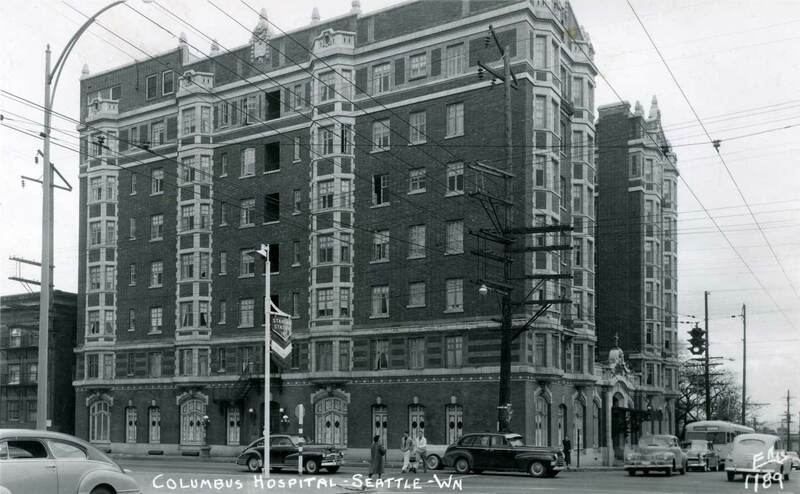 The next three postcards from John are concluded with a general exterior view that was most likely rendered before the building was completed and available to be photographed. 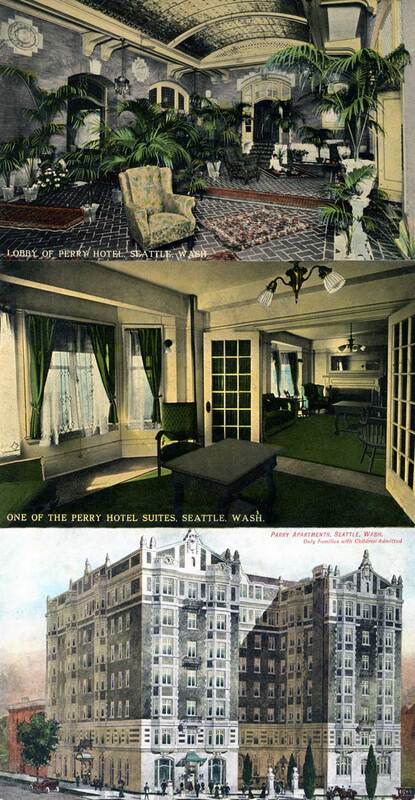 Note the caption at the top of the last postcard. It reads, in part, “Only families and children admitted.” Well beyond childhood, the then barely nascent airplane manufacturer, William Boeing, was one of the Perry’s early residents. We learned this from historian Paul Spitzer, one of whose keen interests is Boeing History having been years past the company’s historian-archivist. 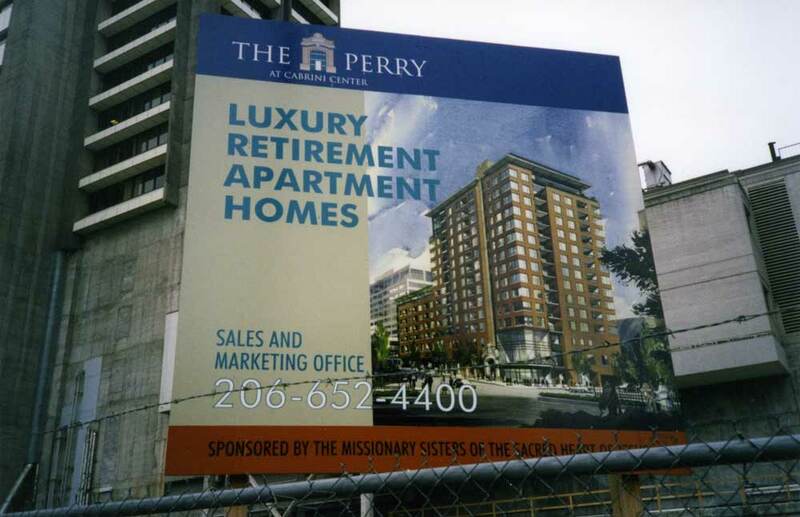 Finally – for now – John Cooper also brought by a snapshot he took perhaps ten years ago of a sign promoting the Missionary Sisters of the Sacred Heart’s first plans for developing their razed Perry Hotel/Columbia Hospital plant. I remember this well. The promotional company hired to market these “Luxury Apartment Homes” enlisted me to help them do some neighborhood selling by scheduling me to give a lecture on First Hill history to prospective luxury buyers and thereby also to help me pay the mortgage on my non-luxury but comfortable Forsaken Art House in Wallingford. It never happened, for the project fell through for want, it would seem, of luxury buyers. The sisters second plans – now in place – involved a much greater component of non-luxury living. 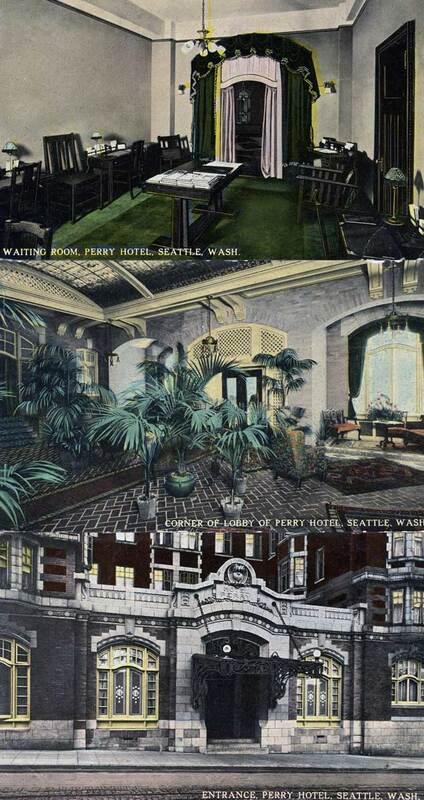 John Cooper has sent along yet another view of the Perry Hotel, this time as the Columbus Hospital. John is almost certainly the greatest collector hereabouts of the thousands of postcards produced by Ellis, an Arlington based photographer who criss-crossed the state many times over several decades recording landmarks of every sort. This view – judging from the motorcars in it – dates from about 1950. I was then 12 years old and knew every model and how they differed from the year before, but by the time I was sixteen I lost interest in car designs and bodies by Fisher or whomever and I have long since forgotten these distinctions. So perhaps some reader who has retained a senstivity for all this will come up with a date. John Cooper has learned the Ellis is not reliable, using the same number more than once and in different years.